Huey Lewis' hustle-line "Karate-oke" might have made a better title to this big-hearted, road-trippy, small-town karaoke contest-hopping, comedy. Huey (sporting Al Franken nerd glasses) makes a living upping the stakes with pretty-boy favorites at anywhereville, USA singing-dives. 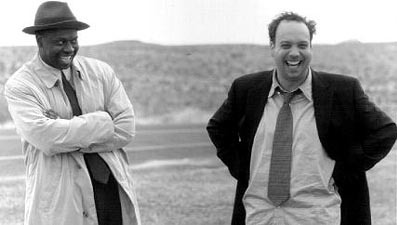 But his is just one of two side stories to the main event -- a frazzled Paul Giamatti's suburban salesman mid-life crisis sends him unshaven and skidding into a reckless life of crossing the double-yellow and singing no-holds-barred to colorized words on the video screen. There's more to the film than that (I didn't even mention Gwyneth's role or the spectacular performance by Andre Braugher or that Angie Dickinson appears briefly); best to leave the rest to surprise. Although the picture has a few screws that could use tightening and a couple of minor "errors in judgment," the direction and attention to detail is just as determined to live life to its fullest as bubble-eyed Paul Giamatti. Delightful peculiarities pepper-spice the film. Examples: A groggy and disoriented Giamatti draws the hotel window shades to a jetliner that's so close it fills the entire pane, a young innocent Speedman comes home to his girlfriend only to hear the guy she just slept with singing in the shower - this is a crystal-fresh way to tell what could have been a Hollywood/soap cliché. Similarly, extraneous characters engulf their roles with richness. Even in their limited screen time, they endear you to the film and strengthen your commitment to the main characters. The most memorable being a kleptomaniac/retired elementary school teacher, "They caught me with a smoked ham in my crotch" and a road-hardened trucker with a John Wayne glint in his eye. Kudos to those savory mini-performances. Btw, adding to the film's sincerity: Giamatti, Paltrow, Bello (and of course Lewis) do their own singing. I didn't like the poster, but loved the film. Duets. Copyright © 2000. Rated R.
Starring Paul Giamatti, Andre Braugher, Huey Lewis, Gwyneth Paltrow, Scott Speedman, Maria Bello, Marian Seldes (teacher), Bill Croft (trucker). Directed by Bruce Paltrow (Gwyneth's pappa). Produced by Kevin Jones, Bruce Paltrow, John Byrum at Hollywood Pics/Buena Vista.